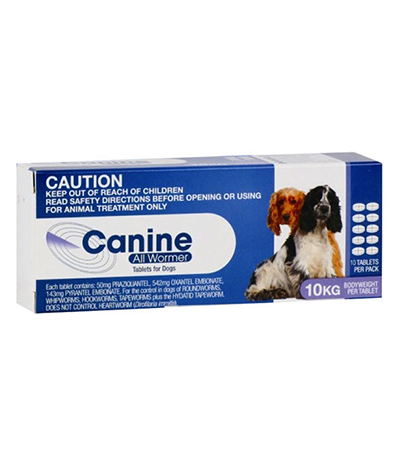 Canine All wormer for dogs, one tablet per 10kg bodyweight. contains 10 tablets. Canine All Wormer offers total protection from all 11 intestinal worms (including roundworm, whipworm, hookworm, tapeworm and hydatid tapeworm). NOT INCLUDING HEARTWORM, SHOULD BE TREATED SEPARATELY, PLEASE SEE NUHEART UNDER PRODUCTS Worming should be completed 2 Weekly up to 16 weeks of age, 1 Monthly up to 6 Months of age and 3 monthly onwards.